Sienna Miller Steps Out With Her Little Lady! Home » Sienna Miller Steps Out With Her Little Lady! Sienna Miller took advantage of a beautiful New York City day and stepped out for a playdate with her daughter Marlowe Sturridge and a friend on Wednesday. While dressed in a knitted dress, the actress carried her little lady on her hip as they strolled through the city. 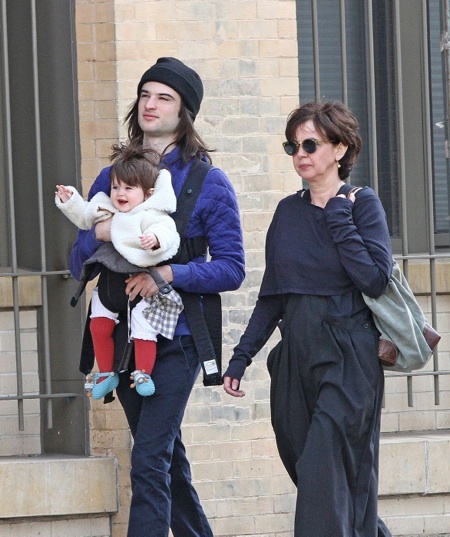 Marlowe made the rounds in NYC on Wednesday. She was spotted out with her dad, Tom, in the morning and then spent the afternoon with her mom. It was also a good day for Sienna, who received a Leading Actress nomination for the BAFTA Television Awards 2013. Later on she grabbed a bite with Tom at a nearby cafe. The family is reportedly staying at Channing Tatum and Jenna Dewan’s apartment while they are in the Big Apple. The arrangement works out well for both couples as Channing and Jenna are living at Tom and Sienna’s Cotswolds home while the actor films Jupiter Ascending in London. Marlowe is carried in a Baby Bjorn Carrier (that’s not attached properly) and wears a pair of knitted Finn + Emma bear booties.